This lovely, old-fashioned dish isn't as calorie-rich as it tastes. 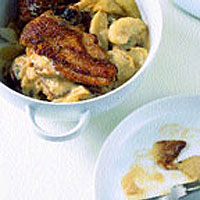 Serve with boiled potatoes, which can be mashed into the delicious, appley gravy, and a green vegetable. Peel, quarter, core and thickly slice the apples. Melt half the butter in a heavy casserole over a medium heat. Add the apples and cider, cover, and cook briskly for 10 minutes. Remove the lid and boil for 5 minutes to concentrate the juices. The apples should be tender and juicy but not overly wet. If you're using guinea fowl, skin it and joint into four pieces, trimming away any fat. Melt the remaining butter in a frying pan, season the guinea fowl or chicken and brown briefly. Bury the meat in the apples. Tuck a piece of greaseproof paper over the pan contents to exclude air, and add the lid. Bake for 30 minutes. Remove the meat from the dish and keep warm. Put the casserole, with the apples, over a medium heat and bring to the boil. Add the alcohol and, a couple of minutes later, the cream. Boil, stirring, to blend and reduce the sauce. Adjust the seasoning. Spoon most of the sauced apples onto a platter and top with the meat. Add the last of the apples, and serve.